Many online businesses aim to optimize and deliver seamless and exceptional cross-channel customer experiences while reducing costs and maximizing return on investment (ROI). Businesses that currently utilize IBM’s Tealeaf CX on premise platform recognize the benefits of understanding customer behavior in helping to uncover areas of struggle to enhance digital experiences. Although this on-premise behavior analytics solution offers robust analytic capabilities, it also requires a significant investment in hardware, software and resources to manage and maintain. Tealeaf on Cloud was introduced as demand for ease of use, flexibility and cost efficiency increased for a cloud-based offering. Tealeaf on Cloud combines AI-powered functionality with the strength and robustness found in the legacy Tealeaf CX on-premise platform. Tealeaf on Cloud offers added advanced analytic features and significantly reduces the complexity and ability to maintain which translates into substantial advantages for your business. Many Tealeaf CX on Premise clients have transitioned over to Tealeaf on Cloud and have realized the many benefits. Let’s take a closer look at some functional and financial reasons to make the move. Struggle Analytics help you recognize areas of struggle, such as repetitive patterns or step counts, allowing you in drill deeper with session analysis to determine the root cause of friction. Geospatial Analytics assist in identifying and understanding where geographically customers are engaging or struggling with your business. Anomaly Detection, a new feature in Tealeaf on Cloud, detects unusual patterns in customer behavior data. With greater visibility into the customer experience, you are well equipped to minimize struggle, uncover areas of opportunity and ensure that your customers progress across all their journeys with consistent and optimized experiences. Click below to view the Tealeaf on Cloud Customer Use Case Videos. Along with advanced analytic features, Tealeaf on Cloud allows you to achieve all the customer experience benefits of a full function on-premise Tealeaf deployment but with greater simplicity and efficiency through technical enhancements. First, a modern user interface offers easy navigation and enhanced views into customer data. Also, with easy deployment of Tealeaf on Cloud, you can quickly implement SDKs to capture data and start getting value in a matter of days. Finally, Tealeaf on Cloud provides you with several added benefits that help you make sense of all the customer data you are capturing to deliver the best possible customer experience. Drastically reduce your IT capital expenses and eliminate the need for further investment in hardware or software – including expensive software upgrades for supporting servers. Receive monthly releases that add new enhancements and functionality to Tealeaf on Cloud with no incremental costs. Minimize the dependency on internal IT resources to setup, install and maintain. Simplify licensing as there are no user charges and no separate charges for additional modules like Overstat and Mobile. With the incremental revenue recognized from optimized experiences and increased conversions, Tealeaf on Cloud maximizes your ROI and expands your ability to focus your time and resources on boosting your business. Ready to Migrate to Tealeaf on Cloud and Realize the Benefits? Do you what to learn more about the additional advanced analytic capabilities and the substantial cost saving your business will realize by making the move to Tealeaf on Cloud? Click the button below to request a complimentary Tealeaf on Cloud Migration Assessment. Read how Shubert Ticketing, a leading international provider of ticketing services, successfully made the move from Tealeaf CX on Premise to Tealeaf on Cloud.Together with the expert assistance from Pereion Solutions, Shubert Ticketing was able to optimize their customers’ digital experiences which resulted in exceptional customer experiences. To access the IBM Tealeaf on Cloud case study for Shubert Ticketing, please click the tile below. Optimize user experience by identifying why customers and/or agents struggle and abandon the process. Supplement the struggle abandonment analytics with heat map analysis to have a more complete view of usability. Utilize segmentation and replay to develop a common cross organizational view of site issues. Develop business impact assessments to help prioritize IT related projects. Eliminate the need for call center representatives to try and recreate customer online problems, by giving them tools to visualize web and mobile experience. Improve customer satisfaction by quickly resolving and web site related issues. Preserve a complete permanent record of customer online transactions and retain them in a document management system. This can be used for audit and compliance purposes, customer disputes, or fraud investigation. Gain complete mobile visibility, including touch screen interactions. Quickly find and isolate problems with mobile sessions. Maintain single approach to customer experience management across mobile and web. Here are a couple case studies of insurance companies that are using IBM Tealeaf and the value they are realizing. Just click on the names below and you will link to the case study. IBM developed a whitepaper on Customer Experience Managment best practices for Insurance based on utilizing Tealeaf software to optimize the customer experience. By clicking on the image below you can recieve a copy of the best practices whitepaper. If you would like to learn more about Customer Experience Management with IBM Tealeaf, please click here. IBM Tealeaf software provides critical customer experience data so you’re able to make the best decisions possible throughout your entire website redesign process. One of the most significant advantages IBM Tealeaf brings to a website redesign is the ability to quickly identify, isolate, and prioritize as many issues as possible as you launch a new website or website upgrade. No new website launch will ever be flawless. Websites today are simply too complex to foresee every single issue. IBM Tealeaf technology provides a tool to quickly isolate areas of customer struggle. With any redesign project there is the potential for page errors or issues in deploying new business processes. Gaining both awareness and visibility to those issues is critical to providing a quick resolution. With IBM Tealeaf’s visual replay functionality, you’re able to identify and visualize difficult issues that you weren't able to catch during the testing phase. You're able to diagnose the problem accurately and prioritize the issues that need to be addressed. As a leader in customer experience management, IBM Tealeaf technology finds, prioritizes and repairs your website issues before they’re able to have a negative impact on your business. Based on proactive discovery and analysis of your customer experience, IBM Tealeaf solutions fully integrate into your website redesign lifecycle, especially during the post-launch stabilization period. You’re able to focus not just on reactive problem resolution, but on proactive discovery with alert capabilities and analysis of customer experience issues. You’re not only able to capture actual behavior, but capture scenarios that would otherwise be unpredictable and difficult to find. After launch, you can use IBM Tealeaf solutions to establish a set of Key Performance Indicators (KPIs) that are useful to decide where on your site you need to invest more time and money. KPI’s can be used for benchmarking your new site as well, without the hassle and inconvenience of tagging and waiting months for results. IBM Tealeaf provides the tools needed to avoid website redesign failure. For more on how IBM Tealeaf optimizes your website redesign project, including customer case studies, please download the IBM whitepaper, Drive Site Redesign Success. If you would like to discuss how to utilize IBM Tealeaf on your website redesign project, please feel free to leave a comment below. You can also contact us directly, by sending an email to slperry@pereion.com. What’s New with the Latest Release of IBM Tealeaf cxLifecyle? For those not familiar, IBM Tealeaf cxLifecycle is an analytics reporting system designed to provide extensive cross-session visitor and segment level analysis in an IBM Tealeaf session. The key enhancements revolve around the milestones in cxLifecycle that provide more powerful, and well-rounded, insight into your customer experience. To further define, milestones are conversion events that compound to define a customer’s full conversion lifecycle. cxLifecycle now allows the user to identify and react to those customers who are progressing from one milestone to the next, and those who don’t. With non-migrators, you’ll be able to understand where and why they abandoned. cxLifecycle users are now able to diagnose, classify, target, and plan their interactions with non-migrators. You’re also able to see beyond single-sessions and metrics to other web analytics tools to discover areas where customers struggle, and areas where they thrive. cxLifecycle now sets specific goals designed to reduce the time it takes for a customers to reach a milestone, giving you the ability to evaluate their effectiveness on your marketing strategy. With cxLifecycle’s ad-hoc reporting, customer lifecycle analysis and visualization, tag management, and data syndication (DDX), Tealeaf users are able to optimize their Tealeaf web analytics. With this Tealeaf technology, you’re able to run qualitative and quantitative analytics, from one tool, to drive more effective customer interactions. cxLifeCycle also allows you to measure long-term, customer lifecycle conversion analysis across multiple channels and devices. With cxLifecycle, users are given the tools to find and quantify trends and anomalies that influences conversion rates. The ability to implement advanced customer analysis of issues found through Tealeaf session replays is also a useful feature of adding cxLifecycle to your Tealeaf software. With these new features of IBM Tealeaf cxLifecycle, you’re able to gain valuable insight from the combination of qualitative and quantitative analytics. This data can be used for extensive ad-hoc analysis, segmentation, and conversion analysis. Or if you have any questions or remarks, please feel free to leave a comment below. You can also contact us directly, by sending an email to slperry@pereion.com. SiteSpect appeals to companies that recognize the value of testing every aspect of the web and mobile customer experience, so you can rapidly test, target, and optimize your website. IBM Tealeaf appeals to companies that value unprecedented visibility into web and mobile customer experience, so they can quickly identify, analyze, and resolve customer issues. Now you can get both solutions implemented together in the cloud for those companies truly committed to optimizing all aspects of their digital customer experience. Wait…Tealeaf in the Cloud? Yes! IBM Tealeaf is historically implemented in a traditional model, by acquiring software licenses, hardware, and implementation services; then implementing in your data center and hiring people to manage the infrastructure and the application. Now you have the opportunity to implement Tealeaf in a private cloud outside your data center, leverage certified Tealeaf resources, and shift the majority of your costs to a monthly operational expense. As a business partner of IBM and SiteSpect, Pereion Solutions provides you with a Tealeaf private cloud hosted in the SiteSpect data center combined with the Tealeaf services you need. Ultimately, increased conversion rates and revenue growth are the real benefits of implementing SiteSpect and IBM Tealeaf. With this integrated solution, you're able to achieve that in a more efficient and effective approach. Sounds great! How do I learn more about SiteSpect? What makes IBM Tealeaf unique? Advanced customer behavior analysis from Tealeaf's session reply and search functions. With these IBM Tealeaf resources, you're able to learn how Tealeaf software delivers Customer Experience Management (CEM) insight into actual customer experiences first-hand, giving you the opportunity for fast customer issue resolution. 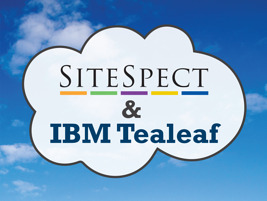 To learn more about implementing IBM Tealeaf in the SiteSpect cloud, please click on the button below to request a free consultation with us.